Westinghouse Review is one of the most remarkable records of life in the London and Chippenham offices during the 1940s and 1950s. 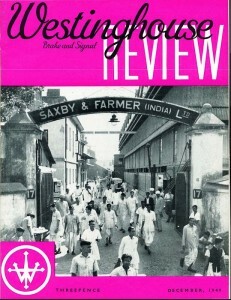 Similar in many ways to the in-house magazines of today, Wes Review had a mixture of works news, people news and trivia! Never free, always paid for, the Review was created by the employees for the employees – with O S Nock editing for much of its run. A future project is the publication of all of these remarkable documents – in a searchable format – but for now the best we can offer is a sample copy stored on Google Documents. Click on the magazine cover below to view this – it is a big document so takes a little while to load.